I was on the lookout for a simple pattern to continue my sampler of supplementary-weft patterns and the positive/negative space studies that I have been writing about these past two weeks. 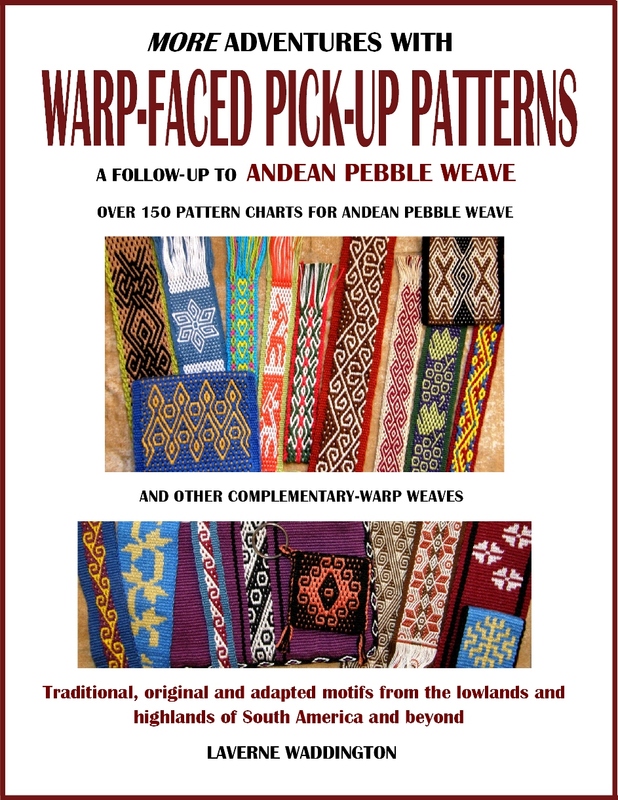 Several of the classic warp-float designs found in the Peruvian and Bolivian highlands have this very characteristic. In the hook motif pictured at left, it makes no sense to talk about “motif” and “background” as the same hook shape flips and turns and dances along the band changing from red to white and back again. Is it a series of white hooks on a red background or vice versa or none of the aforementioned? This was the kind of thing that I wanted to weave with supplementary wefts. So, I set about trying to adapt it to the structure with which I have been working. As it turns out, it wasn’t that straightforward. So, I spent a lot of time with paper and pencil and eraser (I still like the old fashioned way). The only way I could get the shapes to interlink well was to make several changes to the basic shape and, even then, the black version of the hook is not exactly the same as the gold one. The gold has an extra warp or two in a couple of places. There was a fair bit of weaving and unweaving involved too. But that’s what “sampling” is all about, right? I had to remind myself about that as I was starting to regret having set myself this challenge as I seemed to be spending more time planning out the design than actually sitting at my loom. So, there it is. Two sets of gold hooks surround and expose black hooks in the ground weave. I am pretty happy with the way it turned out and hope to play a lot more with this hooky shape. 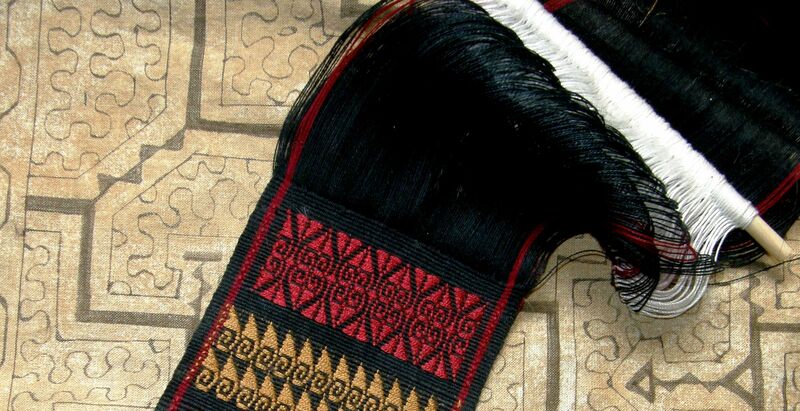 A further important feature of ikat, and indeed of most traditional textiles, is that weavers tend to use a narrow repertoire of simple shapes such as dashes, hooks and curls, in a ‘building block’ fashion to create their designs. This approach makes understanding and copying complex designs manageable for the weaver, and aids their transmission from generation to generation. Recognition of this repertoire of basic shapes (which I call primitives) is also of considerable help to the researcher with analyzing and comparing motifs between traditions,….. So, I took one of my many discarded charts of the hook motif and used it as a “building block” for a new design, joining hooks together, reflecting them and flipping them upside down in the same way that many Andean weavers do with their warp-float motifs. The result is the band of red pattern above the gold in which there are four red hooks with just the hint of a black hook outline around them. 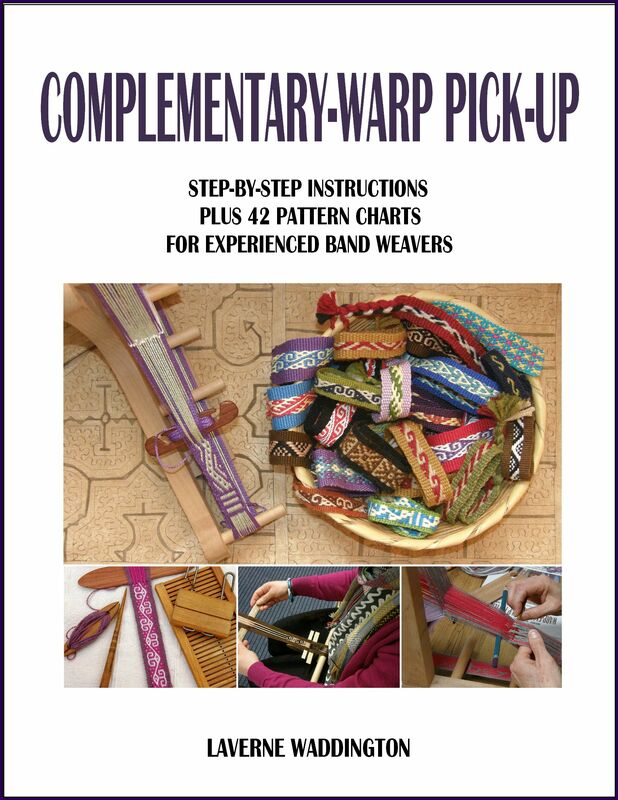 What had brought me, yet again, to Chris Buckley’s interesting article was a romp across the internet in search of hook patterns when my initial attempts at charting something suitable for supplementary-weft patterning were not working out. 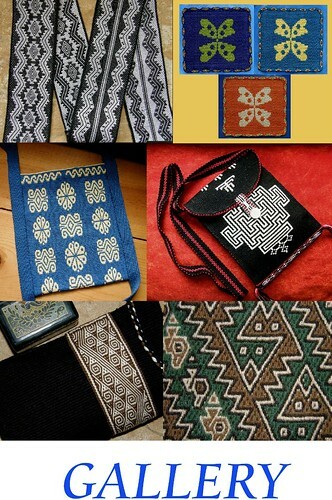 It is so interesting to see how the hooks show up in all sorts of woven structures and cultures. Of course, certain structures only allow a fairly limited repertoire of shapes to be produced and so, regardless of the culture, it is inevitable that a hook motif will appear if those particular structures are in use. 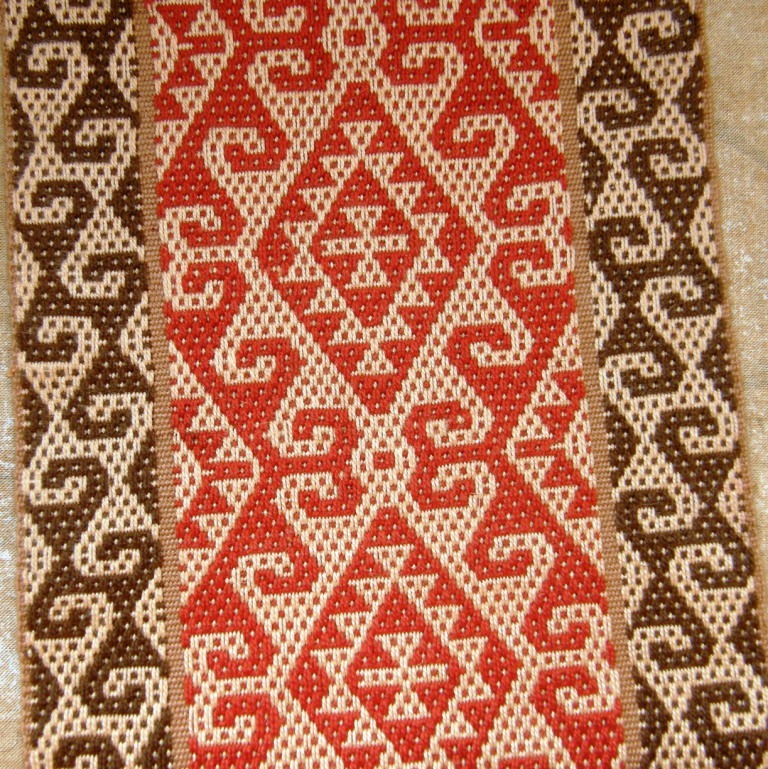 Techniques like ikat, on the other hand, can be used to produce a limitless variety of shapes and patterns. 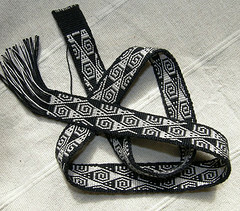 These pictures by Chris Buckley show hook motifs in various SE Asian warp-ikat textiles. I enjoy the challenge of adapting a motif woven in one structure to others. 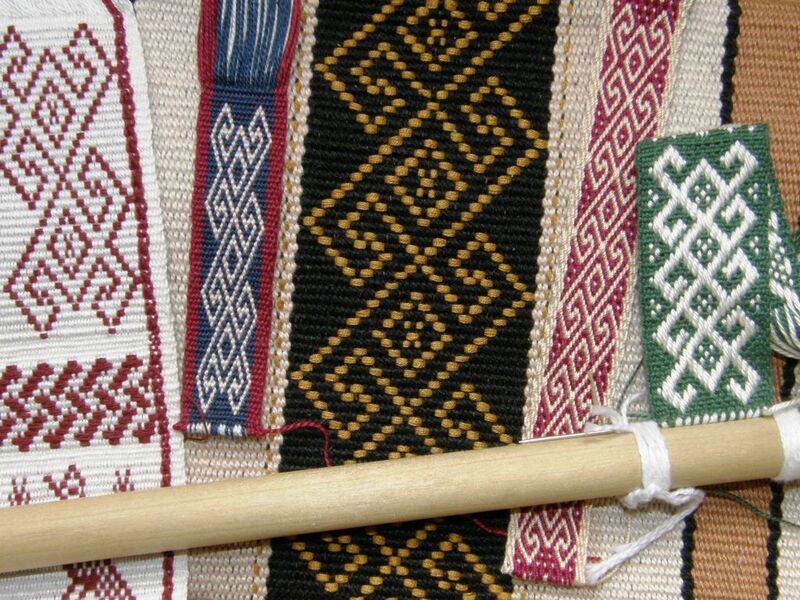 When copying a design from a foreign source, weavers are likely to re-interpret the copied motif in terms of their own vocabulary of basic shapes rather than produce an exact copy. This is analogous to linguistic borrowing, where the pronunciation of a borrowed word may change from one language to another according to the repertoire of sounds available. My own particular “weaving vocabulary” comprises the various structures that I am able to produce rather than a group of shapes. 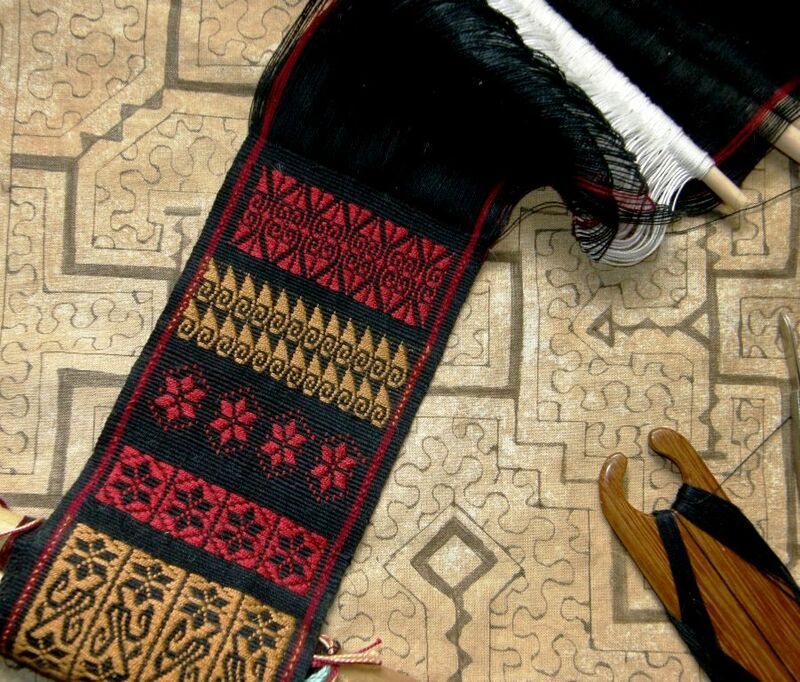 I have not dedicated myself completely to a study of the patterns of any one weaving region and so have not developed a vocabulary that is limited to certain shapes. I love it when I see the Bolivian highland design that I call “rolling river” woven by indigenous weavers in both complementary-warp-float and double weave structures. Perhaps a weaver saw and admired this pattern when she traveled to another region and returned home to interpret it in her own weaving vocabulary which, in this case, happened to be a completely different structure. I can only speculate. I taught Juan to do pebble weave when I was studying in Salasaca, Ecuador. No one in the area was using this structure. 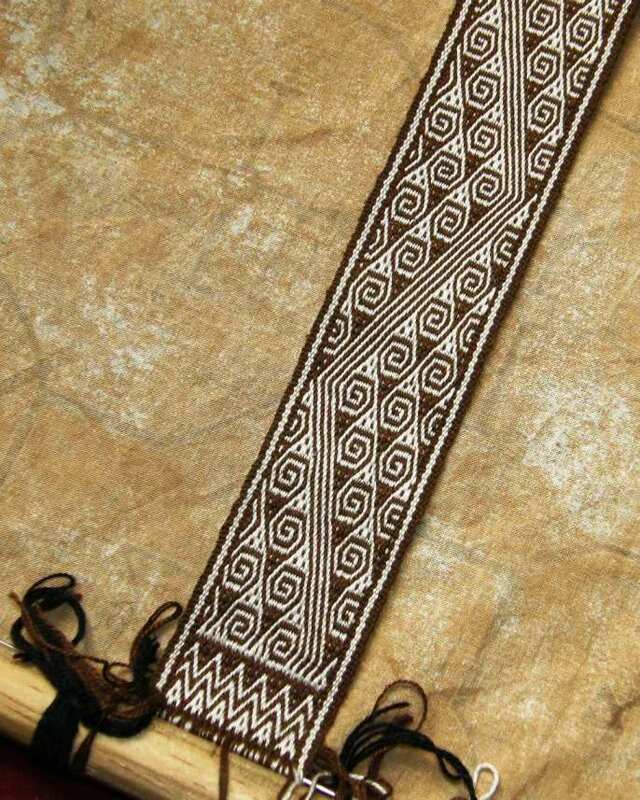 It was part of the deal…I teach pebble weave and they teach me to weave their supplementary-warp patterned traditional belts. 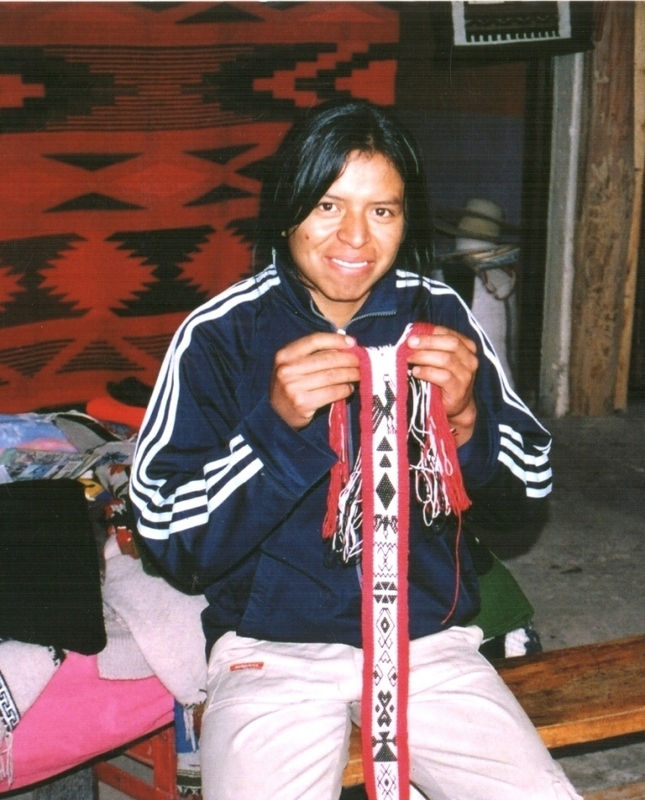 Eighteen months later when I returned, Juan showed me his finished pebble weave band. Until then, he had not known how to weave at all. 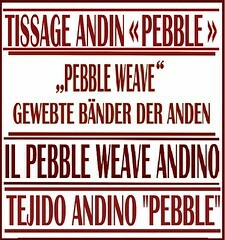 His final motif is a rooster which he took from one of the traditional supplementary-warp belts of Salasaca and interpreted in the only weaving “language” he knew…pebble weave. I thought that was brilliant! I had not become completely familiar with that swirly hook and made it a part of my vocabulary, as skilled Tarahumara weavers surely would have, before attempting this piece and, as a result, it was very tricky to weave! Just as I got a grip on the swirls going in one direction, they changed to the other direction. It was much easier to weave it using another structure in my weaving vocabulary…double weave…in which it is generally much easier to “read” the cloth. However, I don’t think the pattern is as pretty in double weave….maybe slightly more so in my handspun llama fiber on the right (spearmint leaf and cochineal dye). And so I go playing with structures and shapes. Even as I sit and look at the last red supplementary-weft hook pattern that I wove on my most recent sampler, I see the motif on the very right hand edge and think…hmmm….wouldn’t that look good on a narrow double-weave band? 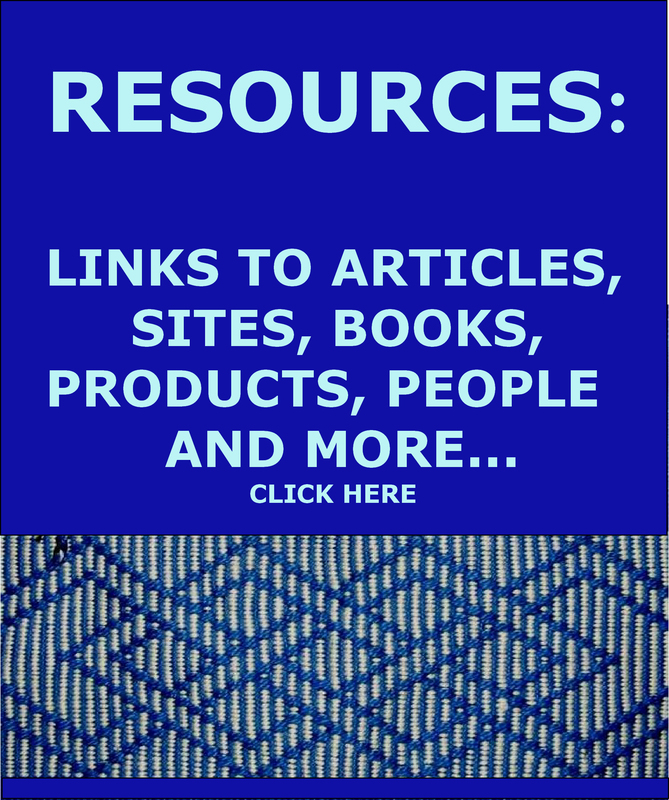 By the way, many of the patterns I have shown in this post are charted in my second book. Here’s one final bit of lovely hookiness before I go. Julia has been using the tutorials in my second book on creating and charting one’s own or adapted patterns in pebble weave. 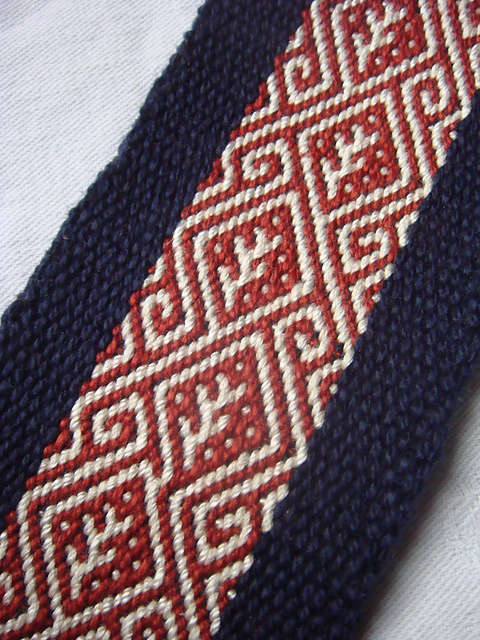 Here is one of her bands in which she has adapted a tablet weaving pattern to pebble weave and…yes…there are hooks! I love all the pictures in this post! 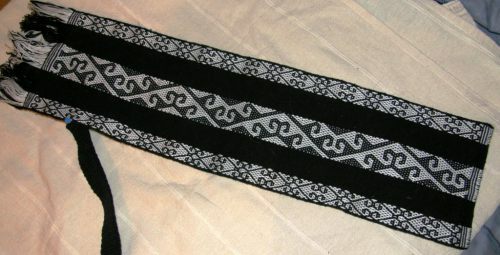 I agree that it is so much fun to adapt weaving patterns and styles top your unique “vocabulary”. It’s a concept I can easily relate to. I only just recently, in a sampler piece on my floor loom, adapted the double weave llama pattern to supplementary weft just for fun. I enjoyed seeing how it turned out! Anyway, I still look forward to reading your blog posts every week! They are always so inspiring and intriguing. Where are you living these days? I am guessing not in France anymore if you are working at your floor loom. Glad to hear that you are weaving.I would love to see your sampler with the llamas. No, I’m not in France anymore. I graduated from college in December, and have been living at home in Kansas since then trying to figure out where I’m going in life. 😉 I also was given a 25″ wide 4-harness floor loom last fall through some weavers I met last semester, so I’ve been starting to delve into the realm of balanced weaves, which is fascinating since I have worked almost exclusively in warped-faced weaves. I’ll show you a picture sometime when I get it off the loom! Love your red supplemental weft design. Are you going to chart it? Maybe in book 3? Julia is so creative. Really enjoy seeing her interpretations in pebble weave. Maybe she will chart them and make a book also! 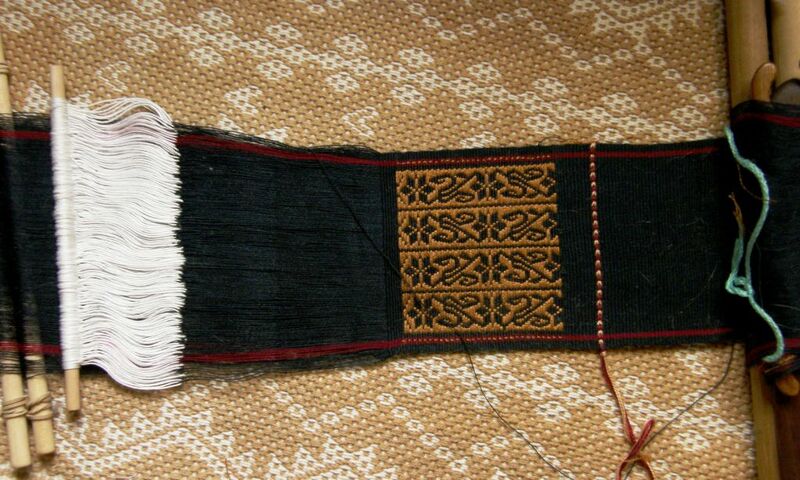 This supplementary weft sampler you are doing is just exquisite! Such delicate and intricate work from a single motif idea – a hook. You’ve certainly “hooked” me. (sorry, I couldn’t resist) It is so inspiring to see such beauty come from a simple idea. It requires skill, artistry and commitment to the craft. Hmm, sounds like someone we all know and admire. ;). I just wanted to say a huge thank you for all the work that you put into your blogs/articles. I discovered back-strapping almost by accident a few weeks ago and became totally enamored by the whole thing. I have just started and am loving every minute of it. My daughter has also just started on an inkle loom that she has been loaned. We have been going through your tutorials together. Thank you again. 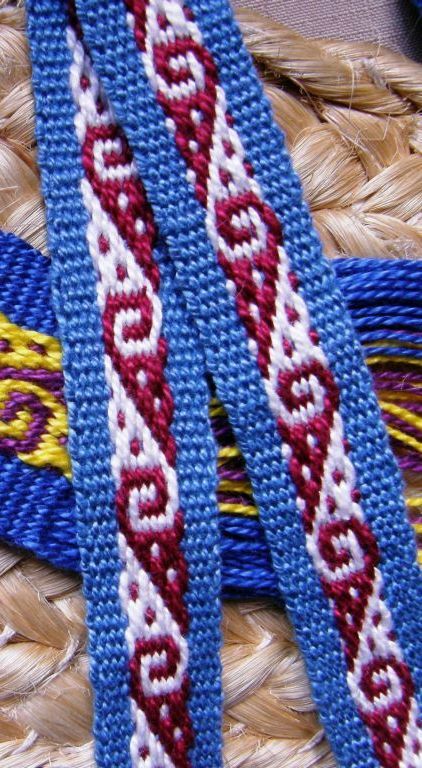 These are a life saver – especially for us “out here in the sticks.” I can’t wait to try some of the more intricate patterns that you do, but am trying at the moment to be diligent and go step by step. Welcome! What fun that you and your daughter are doing this together. I see that you are in Australia “out in the sticks” you say and am wondering exactly where. I hope that you can get hold of yarn that is suitable as that will make all the difference. Thanks for your comments and keep in touch!